You know something just isn't right when the second sentence of an article from telegraph.co.uk reads "Scientists are pushing ahead with powering up the machine, shrugging off speculative fears that it could destroy all life on Earth by sucking it into a black hole." And so it goes, we're one step closer to the Large Hadron Collider, which we've talked about before, coming fully online. 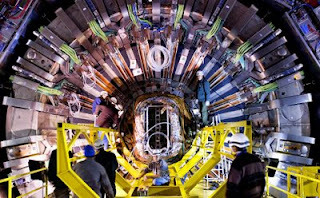 "Earlier this month, the successful injection of the first particles - protons - into part of the Large Hadron Collider (LHC) experiment at CERN, the European Centre for Nuclear Research, took place. So if we don't live to see Monday, at least we'll know why, however it looks like September 10th is the official day this thing is going live. (Someone get ready to update that wikipedia page). So if we don't live to see September 11th, at least we'll know why.